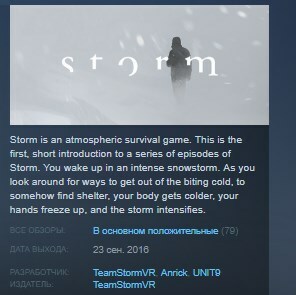 Storm is an atmospheric survival game. This is the first, short introduction to a series of episodes of Storm. You wake up in an intense snowstorm. As you look around for ways to get out of the biting cold, to somehow find shelter, your body gets colder, your hands freeze up, and the storm intensifies. And as you slowly move forward a bigger question rises: who are you? Where are you? How did you get here? Storm is a game about identity, and about destiny. Storm lives somewhere between a film and a game. We were inspired by the visual beauty of extreme environments; an aesthetically beautiful but deadly experience where your body is pushed to the extreme. The snowstorm is just the beginning of a bigger project. We have 5 further levels planned out, and a detailed script in-progress. Each level will take place in different environments. A desert sandstorm, a jungle, a city. And each level will be connected by a narrative where your quest for survival is intertwined with your ability to resolve the mystery around your identity. The main character in Storm is voiced by the amazing Tommie Earl Jenkins.